It could be argued that a family-owned winery in the interior of British Columbia is the finest producer in the entire Pacific Northwest. This pronouncement is based primarily on the results each year of Wine Press Northwest magazine’s annual Platinum Judging, its annual best-of-the-best competition. To be eligible, a wine must have been awarded a gold medal in any of about 50 worldwide judgings tracked by the periodical owned by the Tri-City Herald. Many of these are bargains, and while the wines are not available in the United States, it is worth the effort to visit the winery along the Golden Mile Bench south of Oliver, B.C., just a few minutes north of Oroville. All of these wines won Platinum or better during the judging staged during October in Richland. They are available from the winery and can be found through some retailers in the province. [A list of the retailers can be found on the winery website.] And the prices listed are in Canadian dollars. Gehringer Brothers Estate Winery 2017 Classic Riesling, Okanagan Valley, $13.29: The King of the Platinum nearly produced the top wine of the judging with this quintessential Pacific Northwest example of riesling, perhaps the most decorated wine of the judging. It broadcasts a classic riesling aroma of river rock and stone fruit. It’s glorious on the palate with flavors of fresh summer peaches, hints of jasmine, crushed herbs and a fascinating thread of minerality. Zesty and precise, there’s a kick of lime zest on the forever finish. Gehringer Brothers Estate Winery 2017 Old Vines Auxerrois, Okanagan Valley, $14.29: Few in North America work with this early-ripening white grape that’s most popular in Alsace. It can be argued that no one in the New World does it as well as the Gehringer brothers. It’s delightfully floral on the nose with a suggestion of tropical fruit peeking through. Beautifying the palate are delicate layers of crisp aurora golden gala apples, herbal tea, dried pineapple, lemon verbena and white peach. Lovely acidity keeps it bright and dynamic through the invigorating finish. Gehringer Brothers Estate Winery 2017 Private Reserve Dry Riesling, Okanagan Valley, $13.29: This marks the fourth straight vintage for Walter and Gordon Gehringer to earn at least a Platinum with this style of riesling, which carries less than 1 percent residual sugar. An alluring stone fruit aroma engages the senses. Peach and nectarine fruit mingle with sweet herbs, minerality and a touch of lemon-lime exhilarating the palate. Crisp acidity offers perfect balance, and the scintillating finish persists long after the last sip. Gehringer Brothers Estate Winery 2017 Gewürztraminer/Schönburger, Golden Mile Bench, $15: These brothers plug and play when it comes to this consistently successful 50/50 blend of gewurztraminer and schonburger. The latter is a cross of pinot noir with muscat hamburg and was developed at the Geisenheim Institute in then-West Germany while Walter Gehringer studied winemaking there. Lychee and passionfruit, lemon curd and fresh-chopped herbs unwind in this lightly off-dry white capped by a jovial kick of acidity. Wines such as this can be transformative. Gehringer Brothers Estate Winery 2017 Dry Rock Unoaked Chardonnay, Golden Mile Bench, $14: Here is the third time in four vintages that this historic property north of Osoyoos Lake has earned at least a Platinum for its estate unoaked chardonnay program. Lemon-lime, passionfruit and a squirt of gooseberry form a complex nose. Inside, there’s gorgeous acidity as minerality, light grapefruit flavors and lime combine for a remarkable mouthfeel. HOOD RIVER, Ore. – On the same day Walter Gehringer was crushing his 2018 Sauvignon Blanc, 20 of the Pacific Northwest’s most influential wine judges selected the Gehringer Brothers Estate Winery 2017 Signature Riesling Icewine as best of show at the sixth annual Great Northwest Invitational Wine Competition in Hood River, Ore.
At the historic Columbia Gorge Hotel, judges from Washington, Oregon, Idaho and British Columbia fell hard for the rich nectar from Gordon and Walter Gehringer’s Golden Mile Bench estate. A 375-milliliter bottle retails for $42 in Canada. It marked the second time in four years that Gehringer Brothers topped the Great Northwest Invite, a competition for which the judges nominate the wines they want to taste. In 2015, the best-of-show award went to the 2014 Old Vine Auxerrois grown on their estate in the southern Okanagan Valley. Ellen Landis, a longtime California wine journalist and certified sommelier now living in Vancouver, Wash., travels the country as one of the industry’s most sought-after wine judges. It was her nomination that led to the top wine in the field of 622 entries. “I have tasted a few vintages of Gehringer’s Riesling Icewine on various occasions over the past few years,” Landis wrote via email. “I have always found it very compelling; concentrated and unctuous with brisk acidity keeping it beautifully balanced. Also: The Gehringer Brothers 2017 Private Reserve Pinot Gris and the 2017 Classic Riesling also won Gold at the Great Northwest Invitational Wine Competition. For those of you who have been following the debate over the free trade of wine across provincial borders, there's been some progress. On July 20, 2018, the premiers announced an agreement to amend existing trade rules by 2020 to remove some regulatory barriers to the movement of wine. The new rules will not change direct-to-consumer sales, which remain unchanged nor will the changes apply to businesses with commercial liquor licenses. The premiers agreed that the provinces will continue to review options in these other areas. Although nothing specific was released, generally it is believed the new agreement will allow consumers to carry 18L of wine (two cases), six litres of spirits, and 49.2 liners of beer (six cases of 24). Yukon and Newfoundland and Labrador had not made a final commitment by the time the article went to press. ​Click for more details on this issue. The results are out and Walter and Gordon Gehringer prove again that they reign supreme. The 18th Annual Wine Press Pacific Northwest Invitational Competition was held in December 2017 and Gehringer wines were again recognized as the best. With 6 Platinum and 6 Double Gold, Gehringer Brothers stands at the top of the list of Platinum award winners since the inception of the competition. Click for a list of the 2017 awards, and read more here. It's one of Canada's most expensive and delicious exports. Here are four to try from Ontario and British Columbia. Gehringer Brothers Estate Winery is flying high with Westjet! Read the full article here. Gehringer Brothers Estate Winery 2016 classic riesling, Okanagan Valley, Oliver, B.C. Winemaker Walter Gehringer crafts world-class Rieslings that are a bargain. Gehringer Brothers 2016 Auxerrois named in the top 50 wines of the Northwest! Read the article here. 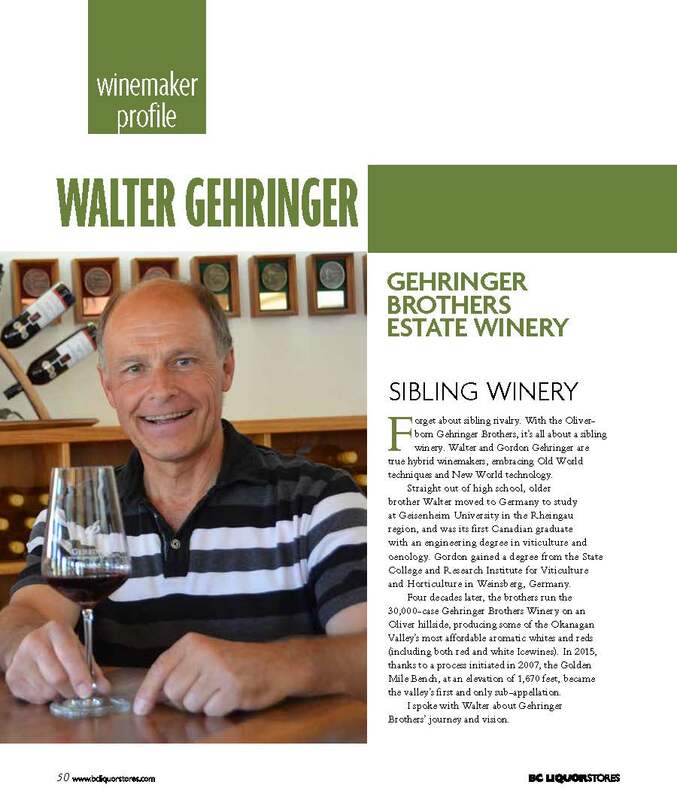 Gehringer Brothers Estate Winery was the focus of a feature article in Taste magazine this quarter. Get the full article here. We don't often get involved in politics, running a winery is enough of a challenge. We do however, believe that the following information is important to wine lovers (and really, every Canadian) and want to share information with you. The province is arguing that the province has the right to control the import of alcohol. Mr. Comeau is arguing that Sec. 121 of the 1867 federal Constitution, which states products from any province "shall … be admitted free into each of the other province," would prevent this kind of provincial barrier. On December 7, 2017 the Supreme Court of Canada will decide who is right. At its most basic from a winery perspective, the outcome of this case means the difference between the unrestricted flow of wine from one province to consumers in another, or the continued patchwork of provincial regulations that can keep you from receiving the wine of your choice from your favourite winery. We care about this outcome on behalf of the entire wine industry. According to Miles Prodan of the BC Wine Institute (BCWI), here's how the wine industry is participating in this critical case. Bennett Jones LLP has agreed to represent the Canadian wine industry on the Comeau case at the Supreme Court of Canada. This law firm has extensive experience representing clients as intervenors before the Supreme Court of Canada (SCC) and will represent the Canadian Vintners Association (CVA) as an intervenor on a pro bono basis. The lawyers will ensure the united position of small wineries, for whom direct-to-consumer is such a critical sales channel, as well as for medium and large wineries across Canada, is persuasively represented. As the primary industry organization British Columbia, the BCWI has been supporting ALL 100% BC wine in the fight for the removal of interprovincial barriers and in favour of direct-to-consumer winery delivery for more than a decade. The SCC case is “the best opportunity in a century” to break down interprovincial trade barriers on alcohol. Success in this case would mean a judicially-backed direction to provinces to permit interprovincial winery-to-consumer shipments. What is the BCWI doing? According to Mr. Prodan (BCWI), "[r]esources are needed to present the best possible case to the Supreme Court. Supporters of Mr. Comeau will be facing the unlimited resources of the provinces and the federal government. David beat Goliath, and Mr. Comeau can beat Government ... but not without support. To ensure a unified & consistent industry position, the BCWI will financially support the Canadian Constitution Foundation (CCF) in the Comeau Case with a commitment of $15,000, as well as an additional limited amount to match BC winery donations." To be clear, Gehringer Brothers has no financial stake in the outcome of this case beyond that of any winery in the country. We are providing this information to keep you informed of a critical issue and by that do not intend to make any political statement beyond our support for fair trade. If you want more information, contact the BCWI. To express your opinion, contact your provincial representatives. We understand that a crowd fund has been set up to assist in the cost of this litigation. Gehringer Brothers has no stake in this fund, nor do we have any role in the fund beyond providing you with this contact information. * Please put "Comeau" in the subject matter of the cheque, or in any cover note. CCF, as a registered charity, issues tax receipts for donations above $25. Golden Mile Bench in the News! "Walter and Gordon Gehringer are by no means new names; they have been a mainstay on the Golden Mile Bench since opening in 1986. Always reliable and well-priced, their offerings punch well above their weight, winning more than 50 “Platinum” awards in competition with other wines of the Pacific Northwest. Their wines have always favoured pure fruit character over oak." 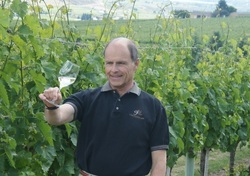 "King of the Platinum-With another eight Platinums (2 Double-Platinum, 6 Platinum) this year, Gehringer Brothers Estate Winery south of Oliver, British Columbia, easily retains the title of “King of the Platinum.” Walter and Gordon Gehringer have won at least one Platinum medal every year except 2001 and 2006 and now have 64 Platinum medals. Click here to read the full article. Gehringer Brothers Estate Winery 2015 Gewürztraminer/Schonburger, Golden Mile Bench • The Gehringer brothers have won more Platinum Awards in this competition than anyone else, and rightly so. This rare blend seduces you with its aromas of spice, apricots and orange peel, then offers a palate of ripe yet lightly sweet citrus. It finishes with Meyer lemon peel, a hint of grapefruit pith and orange zest. (600 cases, 12.8% alc.) Awards: Great Northwest Invitational Wine Competition (double gold/best of class/best white), All-Canadian Wine Championships (gold). Gehringer Brothers Estate Winery 2015 Dry Rock Vineyards Unoaked Chardonnay, Golden Mile Bench • Gehringer has done it again, this time producing a stunning unoaked Chardonnay that displays pretty aromatics, in its complex nose of tropical and honeydew melon. The melon returns as fresh, sweet fruit on the palate, combining with signature Gehringer minerality for a great mouth feel and a long finish. (980 cases, 13.3% alc.) Awards: Great Northwest Invitational Wine Competition (gold/best of class), Northwest Wine Summit (gold). Gehringer Brothers Estate Winery 2015 Ehrenfelser, Okanagan Valley • Never tried Ehrenfelser? This wine shows why you should not ignore this German innovation made possible by crossing the Riesling and Silvaner grapes. It opens with an inviting nose and hint of melon, then adds lemon-lime, sweet peach and apricot aromas and flavors while showing off gorgeous acidity to balance its 1.3% residual sugar, then finishes clean and fresh. (2,500 cases, 13.1% alc.) Awards: Great Northwest Invitational Wine Competition (gold), Los Angeles International Wine Competition (gold/best of class), Northwest Wine Summit (gold). Gehringer Brothers Estate Winery 2015 Optimum Pinot Gris, Okanagan Valley • Is there a white wine those Gehringer boys don’t make superbly well? We think not. This Pinot Gris is indeed “optimum,” with its elements of white peach, unripe pear, white spice and just a trace of color without any phenolic bite. Its good acidity easily balances its 0.8% residual sugar. And its nice lean midpalate makes it just right for food applications, which is rare for Pinot Gris. (250 cases, 13.5% alc.) Award: Indy International Wine Competition (double gold). Gehringer Brothers Estate Winery 2014 Signature Riesling Icewine, Golden Mile Bench • This is but one more example of Walter Gehringer and his crew building a brilliant wine, this time working on a justly famous Okanagan ice wine. It exhibits great balanced, petrol-creamed honey, dried peaches and a bit of botrytis with some nuttiness. As with the best ice wines, there’s pleasing acidity to present the sweetness (26% residual sugar). It’s supplemented with honey, peaches and nuttiness in its finish, lots of viscosity, then orange marmalade in the finish. (1,000 cases, 10.3% alc.) Awards: All-Canadian Wine Championships (gold), Northwest Wine Summit (gold). Gehringer Brothers Estate Winery 2015 Old Vines Auxerrois, Golden Mile Bench • Auxerrois is a rare grape in the Northwest, but when Gehringer works with it, the wine becomes sublime. The 2014, with its 1.1% residual sugar, Pink Lady apple nose, floral aromas and round flavors of peaches and apricots, shows off nice balancing acidity and a perfectly done finish. The 2014 edition of this wine topped the 2015 Great Northwest Invitational Wine Competition. (1,500 cases, 12.3% alc.) Awards: Los Angeles International Wine Competition (gold), Northwest Wine Summit (gold). Gehringer Brothers Estate Winery 2015 Private Reserve Dry Riesling, Okanagan Valley • When you consider Gehringer prices, remember you’re looking at Canadian dollar prices. And that makes this dry Riesling a great bargain with its 0.8% residual sugar, a hint of spice, then orange and lime aromas and flavors, plus a little minerality for a long, clean finish (1,900 cases, 13.2% alc.) Awards: Los Angeles International Wine Competition (gold), Northwest Wine Summit (gold). Gehringer Brothers Estate Winery 2015 Dry Rock Sauvignon Blanc, Okanagan Valley • Pair the Gehringer brothers with almost any white wine grape, and it’s bound to be a winner. With a scant amount of sweetness that merely augments its flavors, this complex Sauv Blanc from their plantings along the Golden Mile Bench brings gooseberry elements with a quiet “meow” in the background. The subtext is filled with lime soda, white grapefruit, lychee, cut grass, savory and slate. (600 cases, 13.3% alc.) Award: Los Angeles International Wine Competition (gold). ​Gehringer Brothers Estate Winery turns science into art. OLIVER, British Columbia — If you’re science-minded, iconoclastic and love good wine, then Gehringer Brothers Estate Winery in British Columbia’s Okanagan Valley should be a destination. On the one hand, Gehringer Brothers has won so many awards and medals that there’s no longer room to display new ones on the walls of its tasting room on the Golden Mile Bench. This family owned and operated winery wears the crown as “King of the Platinum” as a result of Wine Press Northwest magazine’s annual Platinum Judging that determines the best of the best of wines from the Pacific Northwest. Gehringer has won more than 60 Platinum awards at the highly competitive judging, more by far than any other Pacific Northwest winery. And yet, the only barrels at the winery sit outside as mere decoration the entryway. Modern winemaking techniques, such as micro-oxygenation, are used at every step of the wines’ development, but wherever you fall on the spectrum of tradition vs. technology, what’s indisputable is that Gehringer Brothers wines are astonishingly delicious and sell for a song. Read article. Recently, we received an article about a private wine tasting party that included Gehringer Brothers Summer Night and were pleased to see that even in a blind tasting, people prefer our wines! Click here to read the full article by Sam The Wine Teacher, taken froma recent article in My Van City. A special open house was held at Gehringer Brothers Estate Winery last Saturday to show the public the new bi-facial solar roof that the winery installed recently. 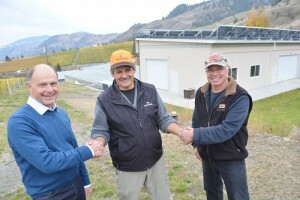 Shown from left are Walter Gehringer, Roger Huber, CEO of Swiss Solar Tech Ltd., and Gordon Gehringer. All eyes were on Gehringer Brothers estate last Saturday; not for their award winning wines, but for their “green” way of doing business. 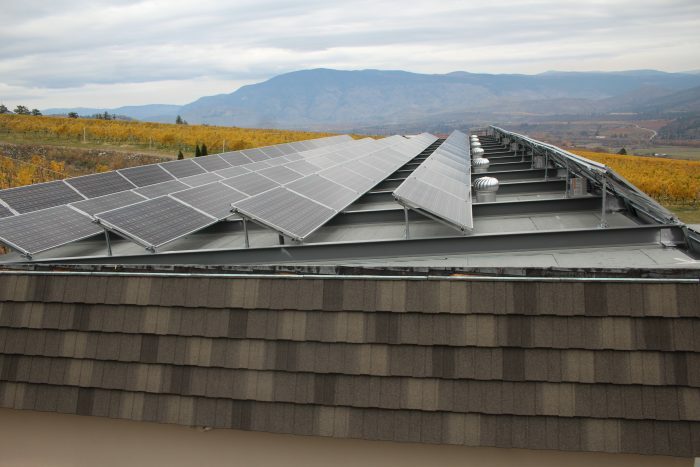 The winery, celebrating its 30th anniversary, showed off its new solar power roof that uses the latest technology. The public was invited to see its 144 solar panels, including bi-facial modules that boost energy production up to 25 per cent through the use of cutting edge duo cells. This innovative development converts sunlight into power not only from the front of the module but from the back as well. The project, carried out by Swiss Solar Tech Ltd. from Summerland, made people forget all about wine on October 29. Read article. The view from the top of the scissor lift showing the solar panels recently installed. Swiss Solar Tech utilizes bifacial solar technology. That means each one absorbs sunlight on both sides of the panel – as opposed to just one side – which can lead to about 25 per cent more power. Given the unbelievable views of the Okanagan Valley, it was somewhat difficult to focus on the reason we were rising rapidly into the air. We were getting closer to the sun, marginally, and that, essentially, is why we were there – to see how the sun’s energy can be harnessed and used to power buildings and equipment. Gehringer Brothers Estate Winery on Rd. 8 held an open house Saturday to provide details on a new venture which ownership believes can transform the way the wine industry operates. Read article. "The festival began in 1979 as a two-day event at the Hycroft Mansion that featured a single winemaker, Robert Mondavi, and the Napa icon attracted a reported 1,000 patrons. Next year marks the first time since 2009 — just ahead of the 2010 Winter Olympics — that British Columbia wines have been given a spotlight. Among the elite wineries pouring at the 2017 VIWF from British Columbia’s Okanagan Valley are Gehringer Brothers Estate Winery and Wild Goose Vineyards. Walter and Gordon Gehringer have dominated the Platinum Judging, the international competition of gold-medal wines staged by Wine Press Northwest magazine since 2000. Last year, the brothers notched their 55th Platinum, which leads the likes of Maryhill Winery, Chateau Ste. Michelle and Jackson-Triggs Okanagan Estate. In 2009, Hagen and Roland Kruger, the brothers behind Wild Goose Vineyards, were awarded the title of Pacific Northwest Winery of the Year by Wine Press Northwest. At the Vancouver International Wine Festival, patrons can expect to meet winery owners and winemakers such as the Gehringers and Krugers, which proves the respect that the VIWF carries within the industry, Sandhill winemaker Howard Soon points out. Walter Gehringer talks winemaking on the Golden Mile Bench. 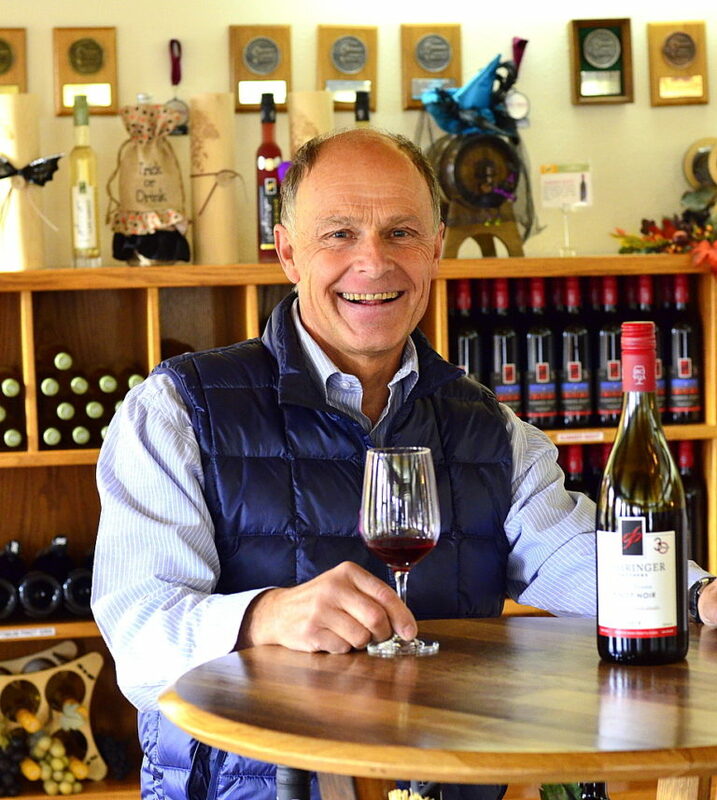 Walter Gehringer is the co-owner and winemaker for Gehringer Brothers Estate Winery in Oliver, B.C. This small family operation is one of the best Northwest wineries you’ve probably never heard of. British Columbia’s Gehringer Brothers Estate produces great wines, especially its world-class rieslings, but you can’t buy them here. Some of the most remarkable and affordable wines in the Pacific Northwest are from a winery that most have never heard of. Gehringer Brothers Estate Winery is just 20 minutes north of the Washington-Canada border, and Walter and Gordon Gehringer have burnished a reputation for crafting dynamic and delicious wines — primarily whites — since their family launched the winery in 1985. In the 1970s, the brothers’ father and uncle dreamed of starting a winery in British Columbia’s nascent wine industry, so they sent the brothers to study winemaking and viticulture in West Germany. Today, Gordon manages the vineyards while Walter runs the cellar. The collaboration has resulted in three decades of success. Of great enjoyment for the adventurous, however, are wines that are far out of the mainstream, including such rare varieties as ehrenfelser, auxerrois and schönburger. Auxerrois, a grape from France’s Loire Valley, is well-suited for the southern Okanagan Valley’s warm climate, and Gehringer’s version should be considered among the finest white wines in the Northwest. 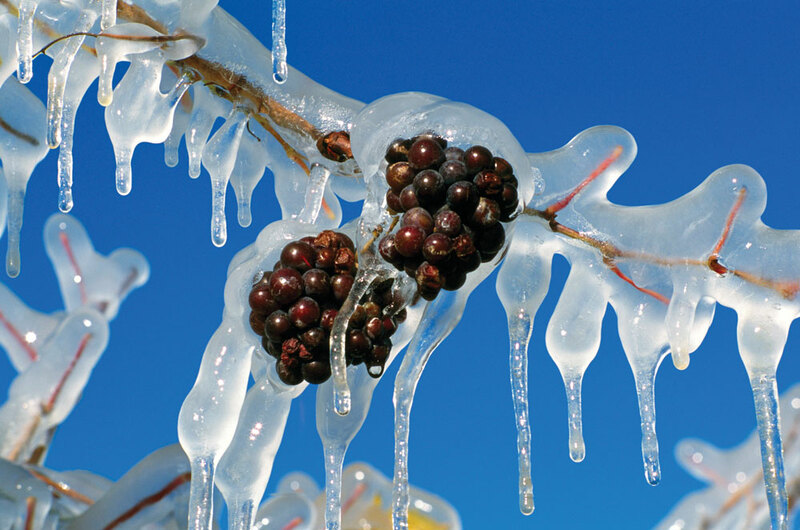 British Columbia winemakers are best known for their stunning ice wines, which are produced by waiting for the grapes to naturally freeze on the vine. Temperatures must reach about 17 degrees Fahrenheit (-8 Celsius) before growers are allowed to harvest the grapes — usually in the middle of the night. The Gehringers typically make three ice wines each year using riesling, ehrenfelser and cabernet franc. ​Here are three superb examples of Gehringer Brothers’ wines. These wines are available only in Canada. All prices are in Canadian dollars. Gehringer Brothers Estate Winery 2014 Old Vines Auxerrois, Okanagan Valley, $14: This obscure French white grape is spectacular in the hands of Walter Gehringer, revealing refreshing yet delicate aromas and flavors of citrus and orchard fruit. Gehringer Brothers Estate Winery 2014 Minus 9 Ehrenfelser Icewine, Okanagan Valley, $42: Ehrenfelser is a rare German variety that seems perfectly suited for great ice wines. This ultra-sweet white wine reveals aromas and flavors of apple pie, apricot and cardamom. Gehringer Brothers Estate Winery 2014 Private Reserve Riesling, Okanagan Valley, $14: Here is one of the best Rieslings in the Northwest. It’s a dry and dramatic white with notes of lime, Granny Smith apple and clove. A perfect wine with crab. Wine lovers will find much to enjoy at Gehringer Brothers, from Merlot and Pinot Noir to Sauvignon Blanc and dessert wines. The winery is best known for its world-class Rieslings, made in no fewer than five styles — from bone dry to succulently sweet.